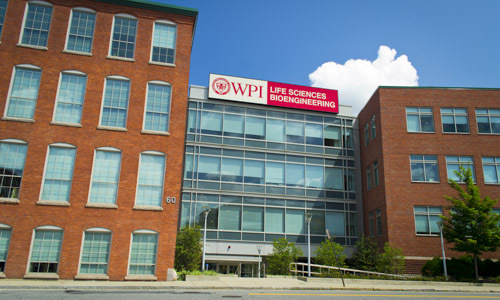 The flagship complex at Gateway Park is WPI’s 125,000-square-foot Life Sciences and Bioengineering Center, (LSBC), which opened in 2007 and is fully occupied with WPI’s graduate research laboratories in biotechnology, biomedical engineering, chemistry and biochemistry, and chemical engineering, as well as offices and labs for several local life sciences companies. Literally and figuratively, the LSBC breaks down walls between disciplines, and fosters academic and business partnerships to facilitate multidisciplinary collaboration for technological innovation and entrepreneurship. The building also houses the Division of Academic and Corporate Engagement as well as WPI's Corporate and Professional Education department.